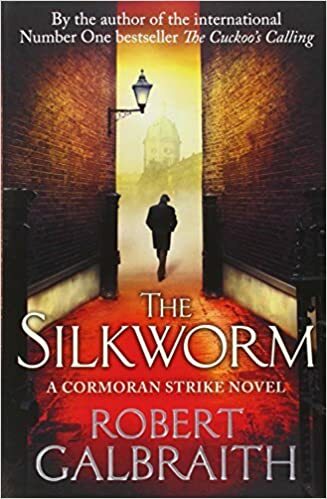 After enjoying The Cuckoo's Calling, I moved straight on to its sequel The Silkworm, the second novel in the Cormoran Strike series written by JK Rowling under the pen-name Robert Galbraith. Given the story behind the publication of The Cuckoo's Calling, it's interesting that The Silkworm has a literary setting. Author Owen Quine has disappeared, shortly after submitting a manuscript to his agent that cruelly and obscenely lampoons a number of well-known figures from the world of publishing, along with his wife and mistress. It's his wife, an awkward, long-suffering woman who bears a passing resemblance to Rose West, who hires Strike - not because she thinks anything's happened to Quine, but simply because she thinks Strike will be able to persuade him to come home. However, this is a murder mystery after all, and in the course of investigating Quine's disappearance, Strike soon uncovers a much more sinister mystery. Although the murder central to The Silkworm is so gruesomely elaborate that it wouldn't be out of place in David Fincher's Se7en, the book still the has the structure and style of a traditional Golden Age detective novel, with Strike edging his way into Quine's somewhat alien world to gain access to suspects, and pitting his skills against those of the police, a conflict complicated by the fact that the investigating officer is a former Army colleague of Strike's. In fact, many more of Strike's friends, acquaintances and relatives also appear in The Silkworm, and while it's not entirely plausible that they would all be quite as helpful to the investigation as they are, their presence is always welcome for the insight it gives us into Strike himself. In the unlikely event that you didn't warm to Strike and his assistant Robin in The Cuckoo's Calling, you would need a heart of stone for them not to win you over in The Silkworm. Both immensely likeable in their own right, the awkward relationship between them is endearing. The aftermath of Strike's broken engagement to the troubled, unstable Charlotte and the disapproval of Robin's own solidly reliable fiance Matthew are also key to this novel, and are a suitable counterpoint to the dark intensity of the investigation itself. There is also great deal of wit to this book, and a great deal of warmth, all of which balances out the snobbery, spite and egomania that Strike encounters as he delves into Owen Quine's background. The less favourable reader reviews of The Silkworm and its predecessor on Amazon sometimes draw attention to a lack of pace and an unnecessary dwelling on detail. Detailed description, and fairly long reflections on the inner musings of the characters, are indeed noticeable in The Silkworm, although for me, they add to the novel's appeal rather than detract from it. I can see myself getting as excited about the next Robert Galbraith book as I currently do about Elly Griffiths' Ruth Galloway novels or Phil Rickman's Merrily Watkins series - and for similar reasons: a recurring cast of likeable, occasionally quirky characters, cleverly-constructed crime plots and a good-humoured warmth that contrasts with the very genuine darkness of the central mysteries.